durable goods, which are designed to last longer than three years, include appliances, tires, batteries, and electronic equipment. Newspapers, clothing, disposable tableware, office paper, wood pallets, and diapers, which all have a lifetime of less than three years, are types of nondurable goods. MSW does not include domestic sewage and other municipal wastewater treatment sludges, demolition and construction debris, agricultural and mining residues, combustion ash, and wastes from industrial processes. 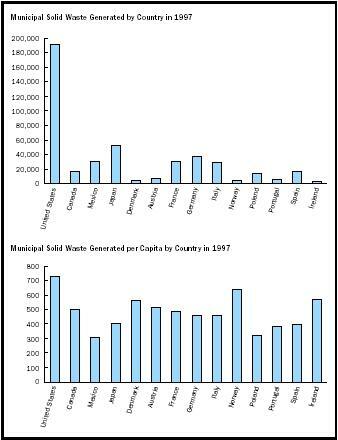 These types of waste, known collectively as industrial solid waste, are largely excluded from hazardous waste regulation; programs addressing industrial solid waste are still in their infancy. Source reduction, also known as waste prevention, is a front-end approach to addressing MSW problems by changing the way products are made and used. It represents an attempt to move away from the traditional "end-of-the-pipe" waste management approach used in the past. Source reduction at the "beginning of the pipe" is defined as the design, manufacture, and use of products in a way that reduces the quantity and toxicity of waste produced when products reach the end of their useful lives. Waste-prevention activities include product reuse (e.g., reusable shopping bags), product material volume reduction (e.g., eliminating unnecessary product packaging), reduced toxicity of products (e.g., use of substitutes for lead, mercury, and other toxic substances), increased product lifetime (e.g., design of products with a longer useful life), and decreased consumption (e.g., changing consumer buying practices, bulk purchasing). In 1996 the EPA reported that 23 million tons of MSW had been source-reduced, approximately 11 percent of the 209.7 million tons of MSW generated that year. Businesses, households, and state and local governments all play an active role in implementing successful source reduction programs. issues through source reduction, recycling, combustion, and landfill programs. Such community-tailored programs provide possible long-term solutions to decreasing the amount of waste that is produced and ultimately placed in landfills. SEE ALSO C OMPOSTING ; I NCINERATION ; L ANDFILL ; P LASTIC ; R ECYCLING ; R EUSE ; W ASTE ; W ASTE R EDUCTION . U.S. Environmental Protection Agency. (1999). 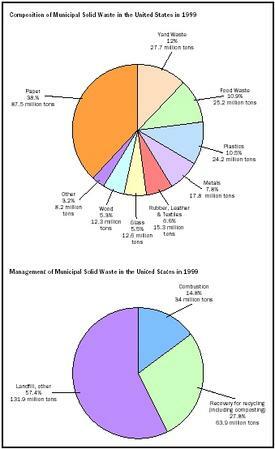 National Source Reduction Characterization Report for Municipal Solid Waste in the United States. Washington, D.C.: U.S. Environmental Protection Agency. EPA530-R-99-034. Also available from http://www.epa.gov/epaoswer/non-hw/reduce/r99034.pdf . U.S. Environmental Protection Agency. (1998). Puzzled About Recycling's Value? Look Beyond the Bin. Washington, D.C.: U.S. Environmental Protection Agency. EPA530-K-98-008. Also available from http://www.epa.gov/epaoswer/non-hw/recycle/benefits.pdf . U.S. Environmental Protection Agency. (1999). Recycling Works! 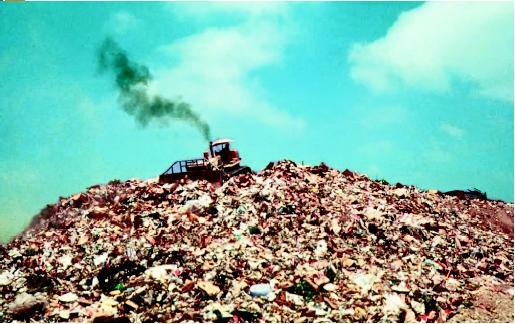 State and Local Solutions to Solid Waste Management Problems. Washington, D.C.: U.S. Environmental Protection Agency. EPA530-K-99-003. Also available from http://www.epa.gov/epaoswer/non-hw/recycle/recycle.pdf .